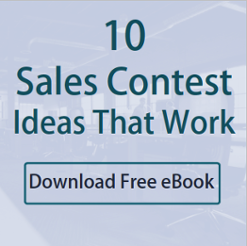 Launching a Sales Contest? Communicate it Effectively. 1. Stay on top of communications, so your team keeps the competition top of mind. 2. Keep the competition simple, so your team clearly understands it. Use this email template to launch your next contest, and you’ll be tackling both…. The winning [team/employee] will have the [metrics for winning, i.e., highest percentage of appointments, quickest turnaround in service cases, etc.] for [time period of competition]. All percentages and goals are tracked within [name your CRM]. The winning [team/employee] will get [incentive]. I will send leaderboard updates via email twice a week. You can also see up-to-the-minute results by going to our leaderboard report here [–> Link “here” to your report in salesforce.com]. If you have any questions about the contest, let me know. And good luck! The winning team will have the highest percentage of bookings to their target for November. All percentages and goals are tracked within salesforce.com. The winning team will get a team lunch (and bragging rights). Approximate value: $250. Most people receiving this email are eligible, with the only exception being the management team, who will keep an eye on the leaderboard. Attached is a full list of participants, if you’re interested. I will send leaderboard updates via email twice a week. You can also see up-to-the-minute results by going to our leaderboard report here. One of the keys to a successful sales contest is maintaining strong communication around it. You can start with this email template.